At Baker's Field, we don't use commercial yeast. By "commercial yeast," I mean yeast you buy at the store, usually in little packets. Two of the most common types of commercial yeast are active dry yeast and instant yeast. Most bakeries and home bakers use commercial yeast -- it's predictable and easy to use. Bread made with commercial yeast works fast -- you can mix a dough, and bam, you’re eating bread a few hours later. We opted out of this quick, easy to use product and instead chose to create naturally leavened bread, which means we make our own yeast using bacteria from the flour and the air. In other words, we use a sourdough starter in our dough. We love the complications of working with naturally leavened dough -- there are a couple more steps and adjustments throughout the process. The flavor is elevated. It's all very natural. However, last month we had some bakers visiting Baker's Field. These bakers use commercial yeast and wanted to play around with making baguettes and ciabatta with commercial yeast. 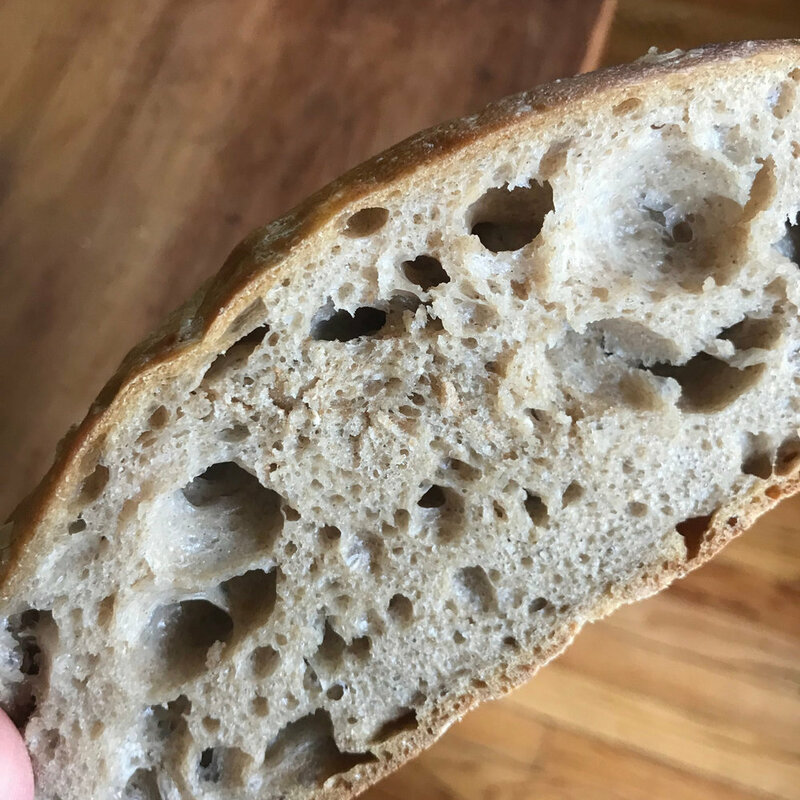 This got me thinking that likely many of our customers are using commercial yeast at home, and that perhaps those customers would like a recipe to use with our flour. Anyone out there screaming, yes, pleeaassee?! Well, your calls have been answered! With you, our customers, in mind, I made the much talked about no-knead bread at home. I wanted to make the bread at home (versus the bakery) to get the full home baker experience. I used our sifted bread flour (obviously! ), with the goal of adjusting the recipe to work with fresh flour. If you’re a dedicated reader, you already know that working with fresh flour is different than working with industrial flour. So, here’s my tip for making no-knead bread at home with Baker’s Field Flour: add more water than the recipe calls for. The no-knead recipe calls for 300 grams flour and 210 grams water. I added 300 grams water to my mix. The dough was indeed quite wet and hydrated, but I simply folded the dough after half an hour to add a little strength, and the finished product looked (and tasted) great. If you’re wary of working with a very wet dough, you could add 270 grams water instead. We talk all the time about how we use local grain and fresh flour to make our bread. I hope that by now you know that our grain comes from the Upper Midwest. But just in case you don’t know, I’ll say it again: Baker’s Field grain is grown in Minnesota and North Dakota. Jake Kulju of Skinny Jake’s Fat Honey. We use Jake’s honey in our Goodwich sandwich bread. It is one of my favorite ingredients in the bakery. Jake delivers his honey in 5-gallon buckets. Jake’s floral honey is thick, amber liquid gold, and when we bakers scale the Goodwich, we get the treat of handling this gift of a product. Lastly, here’s the scoop: come summer, Jake will be keeping some of his hives on the roof above Baker’s Field. How’s that for local? I know that my co-workers are rolling their eyes at my love for Valentine’s Day. It was my idea a few winters ago to sell our cookies in heart shapes for Valentine's (not an original idea, I know! ), and I still feel a whirl of excitement when we get to take out those heart-shaped cutters. It’s time, people! This year, Valentine’s Day is getting more and more fun. You can visit our online shop for the deets on our special Valentine’s items (orders must be placed by February 10th). We’re making chocolate cherry bread! Chocolate rye cookies! Lemon tea cake! Annndddd linzer cookies cut into hearts!! My love of hearts aside, the best part about the linzers is that this year, they will be filled with Serious Jam, made locally by Heidi Skoog. (Obviously, we’re using raspberry jam since it had to be red.) We’re so excited to be using Heidi’s product, so I thought I’d take a minute to introduce you. Heidi sources as much fruit as she can locally, focusing on organic and sustainable farms. This past year, around 85% of the fruit was local! Pretty impressive, I think. Pure love right there, folks! Enjoy those linzers, and don’t forget to place an order for Valentine’s Day treats! Here at Baker’s Field Flour and Bread, we fire up our flour mill around 4am and then usually mill for the next 7 to 10 hours. On average, we mill around 900 pounds of flour a day. The baker scaling flour for the next day’s dough mix uses flour milled just hours before it’s scaled -- sometimes it’s even still warm from the mill! Our packaging team starts scooping and weighing flour late in the morning, again using flour milled that day. When we say fresh flour, we mean fresh flour. As you (hopefully!) know, we sell flour directly to our customers through many of the local food co-ops and our online shop. For bulk flour orders, we are also happy to offer pick-up from the bakery. But today I’d like to focus on the restaurants who buy flour from us. We feel lucky to have these partners who value our local, fresh product -- we are also in awe of how skillfully they use our flour. In addition to pasta, Spoon and Stable also makes daily bread with Baker’s Field flour. They also use the middlings we remove from the wheat when we are sifting flour. Every day, we have anywhere from 50 to 150 pounds of middlings. Spoon & Stable uses these middlings as you would cornmeal to make their EPI bread, which is a baguette cut into a shape that resembles a wheat stalk. Of course, many other restaurants in town order our flour. If you’re interested in a complete list, visit our website. We’d love if you continued to support these establishments that believe in supporting local. In the meantime, thank you for reading and loving fresh flour as much as we do! As the first snow of the year fell, we bakers paused for a moment to stare out the window in silence. We typically don’t stop working, so this quiet moment of stillness felt special. The first snow! As always, we were all dressed in tee-shirts, and were plenty warm because bakers never stop moving, there’s always something to do, and because the wood-fired oven is always churning out heat, 500 degrees all day. Winter at the bakery is cozy. Through our online shop, you can pre-order pie, cookies, caramel rolls, squash rolls, and bread. Items can be picked up at FOOD BUILDING on Wednesday, November 21st between noon and 5pm. Although it’s hard to choose, my personal recommendation? The caramel rolls. These sweet, sticky treats will be ready to be baked on Thursday morning, so you can impress your family with fresh, warm caramel rolls. My second recommendation? Squash rolls. These little rolls are slightly sweet and plenty soft. They are a huge step up from plain buns and will elevate your Thanksgiving meal. We’ve already discussed why we bakers here at Baker’s Field mill our own flour. As eaters, we love the nutrition and flavor. As bakers, we relish the control and craft. All excellent reasons for you, the home baker, to add our bakery-milled flour to your kitchen pantry. However, our flour does behave differently than the industrial flour you may be using now. We are here to help you adjust and discover the miracle of fresh flour! 1. The general rule is that fresh flour tends to need more hydration than industrial flour. So if you’re baking bread, keep this in mind. Be ready to use more water. 2. Fresh flour has a lower tolerance for mixing; you will not need to mix or fold dough made with our flour as aggressively as you may be used to. 4. In general, bread made with fresh flour will not get as much volume as bread baked with industrial flour. Know this before you begin so you won’t be surprised. BREAD FLOUR: Our high-extraction bread flour is sifted to remove some of the bran and highlight the germ and the endosperm. This is different than the “white” industrial flour you may be used to buying, which contains no germ. We prefer to keep the germ and some of the bran in the flour for both flavor and nutrition. A hard red spring wheat grain, the defining characteristic of bread flour is creamier bread. WHOLE GRAIN FLOUR: Commonly known as whole wheat flour, this variety of hard red spring wheat flour contains the entire grain -- the bran, germ, and the endosperm. This is a highly nutrient rich flour. We love making bread that uses all the parts of the grain -- the flavor is earthy and grassy and just special! PASTRY FLOUR: We sift organic soft white winter wheat for this flour, removing some of the bran. This flour can be used like all-purpose flour. It is lower in protein (and therefore gluten) than our bread flour, and therefore is not meant to be used for bread. If I’m at a gathering with many people I don’t know and the news that I’m a baker spreads, someone is sure to tell me that they bake bread at home. I love these stories; please don’t stop sharing them! But I’m writing today specifically about the questions people ask me. The questions are usually all over the place, and I don’t always have all the answers. It’s often hard to help when you don’t know all the specifics. BUT! I’m here today to give all you dedicated (or occasional!) home bakers some tips. Temperature, temperature, temperature! Learn what water temp you need to use to achieve the ideal dough temp. Learn to adjust to the weather (room temperature will affect your dough). This will help your bread be more consistent. Play with the amount of water in your dough. This is the variable that can change the crumb and texture of your bread. If you’re using a starter, feed it regularly. Here at the bakery, we feed ours every 12 hours. Every 24 hours will work too (this is probably more realistic). Keeping your starter in the fridge for a few weeks is okay too. Just take the starter out of the fridge a couple days before you want to bake and feed it a couple times before baking. Come take a shaping class at Baker’s Field to perfect the look of your loaf! This may seem like shameless advertising, but most home bakers struggle to teach themselves how to shape bread. We can help! Why mill our own flour? When I first talked to owner/head baker Steve about working at Baker’s Field, he said, “Okay, I can tell you love baking and that you have experience, but what about milling? Does that excite you?” Because I was in interview mode, I responded with an enthusiastic YES to this question. But in reality, I wasn’t exactly sure what was so exciting about milling flour. Baker Nate loves milling because the mill itself, as a piece of equipment, is a product of fine craftsmanship and poses “fun” problems that sometimes need repairing or adjusting. Nate is correct that our mill is a thing of beauty: built by professional baker Andrew Heyn of New American Stone Mills in Vermont, our mill boasts artistry and practicality. It is typically pretty simple to use, yet the work that went into creating the mill is intricate, thoughtful, and skillful. Beyond the beauty of the machine itself, in my two years of working at Baker’s Field, I’ve come to fully understand why freshly milled flour is so exciting, and why we opted to add this extra step of baking. It’s simple: fresh, stone-milled flour from local, organically grown grain tastes like nothing you’ve eaten before. From Bolles to Ingmar to Prosper to Forefront, each grain has its own flavor profile. The taste and textures of the bread made with this flour are complex and nuanced. Tasting notes often include the words nutty, grassy, earthy. The grain flows from the hopper on to the granite stone, creating even particles of all three components in the grain -- endosperm, germ, and bran. The whole grain flour shoots out of the front of the mill. Our high extraction flour, which is also called sifted flour, bread flour, or simply “white” flour, goes through our sifter, but still maintains elements of the germ and bran. This makes both our whole grain and bread flour rich in fiber, and therefore much more digestible, nutritious, and flavorful. As an eater, I’m hooked by the complexities and depth of the flavor of the grain. As a baker, I’m challenged and fueled by the demands of freshly milled flour. Fresh flour is different than industrial flour. It absorbs more water and requires less mixing. We have to work harder to get volume in our baked loaves. We are constantly adjusting to grain that creates different types of dough. This is part of the fun of working with local, non-industrial grain. Our staff of eight bakers fire up the oven and mill at 4:30am every day of the week. Right away in the morning, one baker boils the day’s bagels; another begins the day’s dough mixes, starting with the rye. A third baker loads our seeded and table loaves into the oven. On the bench, the fourth baker divides the filone. We have a routine; it’s the same every day. This daily routine may seem boring to some. But actually, the repetitiveness is part of the fun. The bakers are a well-oiled machine, moving around (on a good day, at least!) like a team playing a group sport. Just like a sports team, “practicing” each day is key to our success. We end the day with the next day’s seeded and table loaves shaped and in the retarder overnight for a slow fermentation. The filone dough also retards -- to be shaped and baked the following morning. Our daily cinnamon rolls slowly rise in the proofer. We clean the benches, mixers, sinks, and floors (the glamorous side of baking). On our way out the door, we usually grab the day’s extra bread for our dinners. A very informal poll of the bakers found that we each eat about two loaves of bread a week! Cinnamon Rolls are now available atSeward, Eastside and Lakewinds Co-ops! They are rich, tangy, and sweet with a cinnamon chaser. Pick up a four-pack of these delicious rolls to go with your morning coffee or as an afternoon snack. As we all move into summer mode, it's time to fire up the outdoor (or indoor) oven and get baking! We have flour options that are perfect for bread, pasta, cakes and cookies. Visit our or our retail partners where we have three sifted and whole grain wheat types, whole grain rye, and pastry flour available. Our fresh flour, even when sifted, retains most of the whole grain intact. Whole grains have lipids, vitamins and minerals present. That means flavor, nutrition and fiber. Taste the difference, and get baking! Babka: Just in time for Mother's Day! Baker's Field is upping our sweets game. Introducing Chocolate Babka and Cinnamon Rolls in retail 4-packs! What could possibly make our brioche dough better? How about a rich chocolate swirl and a touch of cinnamon! In Polish, "Babka" literally means grandmother, so we're launching this delicious, naturally leavened treat just in time for Mother's Day. We are making these available in retail 4-packs and to begin they will be available at Seward Co-op and Eastside Co-op. 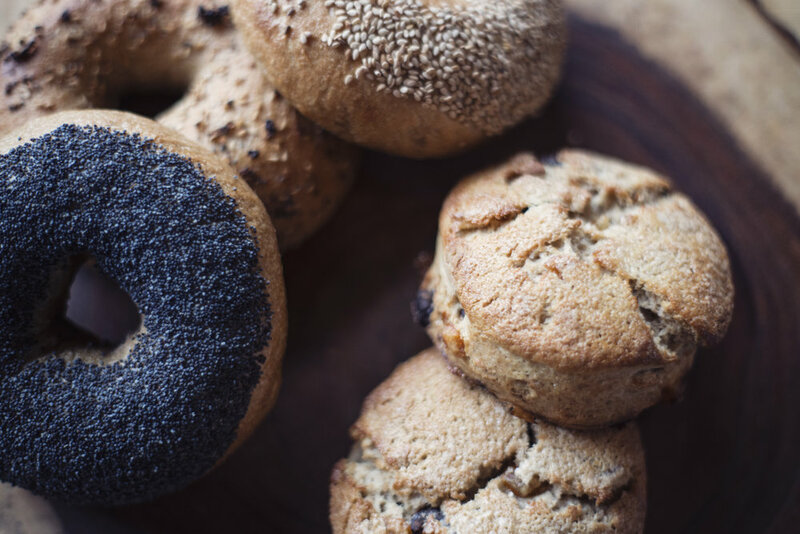 This bagel recipe from Bakers Hannah and Siri talk you through everything you need to know to make chewy and flavorful bagels at home. Well, I’ve lapsed in my effort to produce a monthly newsletter. Usually I’m elbow-deep in dough. Since you last heard from me, we have received more Forefront from Luke Peterson and have started a relationship with Ben Penner and his Turkey Red wheat. Both growers are less than two hours away, and it sure makes me feel connected to people and place and the flour itself. We’ve had a ball teaching classes and continuing to mill and bake daily. It’s been the blink of an eye, but we’ve been milling and baking in NE Minneapolis for 12 months now. Like any homeowner knows, maintenance is key for keeping everything humming, and the same is true for our mill.